It’s a soupy time of year, isn’t it? So just stop fighting the urge to juice cleanse and give in to the steamy goodness of this Garden Therapy recipe. 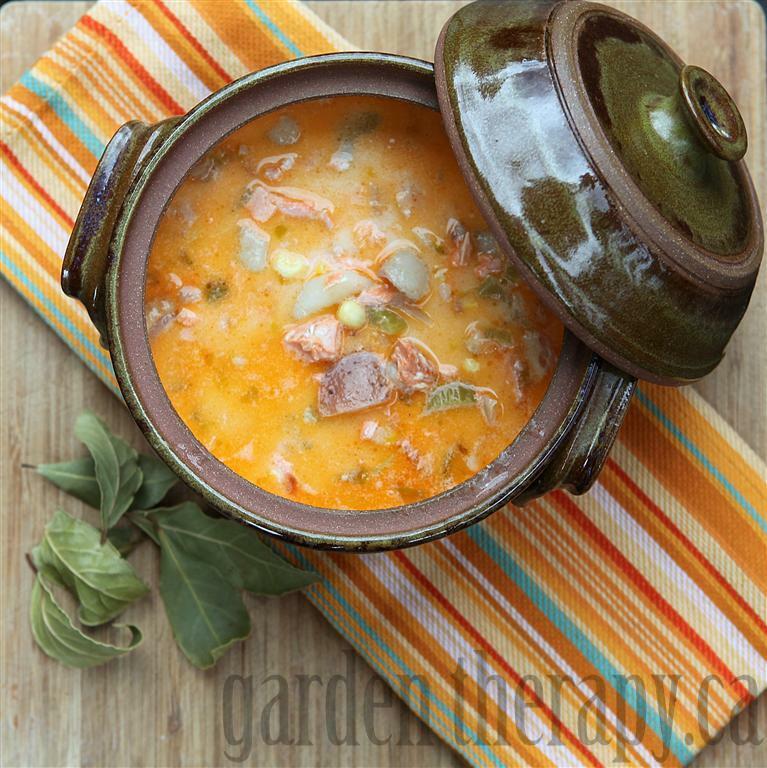 Yes, salmon chowder might sound a bit indulgent after the diet sins of the holidays, but look at it this way: Omega-3s will improve hair, nail and skin health – just what you need in winter weather. Also, butter will improve your mood. Works for me every time. In a large stock pot, saute bacon and onions until soft and bacon fat is cooked down. Add celery and leeks and saute further, until soft. Add in a bit of chicken stock to the pot if the mixture gets dry and begins to brown too much. Add in 6 cups of chicken stock and potatoes and bring to a boil. Add carrots, corn, mushrooms, salmon, and spices then turn down heat and simmer. Top with more chicken stock if veggies are not fully covered. When potatoes are tender, remove the 4 potato halves and transfer to a smaller pot. Add butter and cream to the pot and blend with an immersion blender. The mixture will become thick and gluey quite quickly. When smooth, ladle mixture into chowder and stir until completely mixed in. Continue to add ladles of the potato mixture until you get the consistency of chowder you want. Add salt and pepper to taste and serve with warm crusty bread. Mmmm.